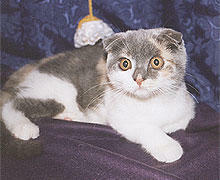 The first Scottish Fold was born in a litter in Scotland in 1961. Two years later the mother cat, Susie gave birth to 2 kittens with folded ears. A breeding programme was begun in Britain but when it was discovered that some cats with folded ears had thickened tails and limbs the governing registration body banned them from all shows. British breeders resorted to registering their cats overseas with the main centre being the United States. Because of the danger with the rigidity of the tail and the stiffness in the limbs two folds cannot be bred together. They are usually bred to British or American shorthairs or to prick-eared offspring of folds. The folded ears are due to a single dormant gene, so some kittens in a litter will have them, but not all. 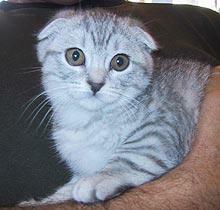 A Scottish Fold must have at least one fold-eared parent. This unusual cat has an almost owl-like expression. It is medium in size and well rounded with a flat scull and large round eyes. A smaller, tightly folded ear is preferred over one that is loosely folded and large. The tips are rounded. The wide-open eyes usually correspond to the coat colour. They come in different colours and patterns except lilac, chocolate and colour pointed and each variety has identical colour to its shorthair equivalent. The coat comes in long and shorthair versions and should be dense and resilient. Regular brushing removes dead hair and keeps the coat in good condition. The folded ears need to be kept immaculate by gently cleaning inside the folds with a moistened cotton swab. Because of the mixture of British and American Shorthair ancestors the Fold has the best traits of both breeds. They are a loving, placid and companionable and easily adjusts to other pets. It is hardy cat with a sweet nature; it has a tiny voice and is not very vocal. The female makes an excellent mother and the kittens can be quite precocious. Their activity level is moderate and many have the peculiarly uncatlike habit of sleeping flat on their back. 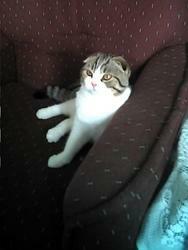 Scottish Folds adore company and are not happy if left alone for long periods of time. In spite of it's strange ears they have perfectly normal hearing and is no more prone to infections than cats with conventional ears.